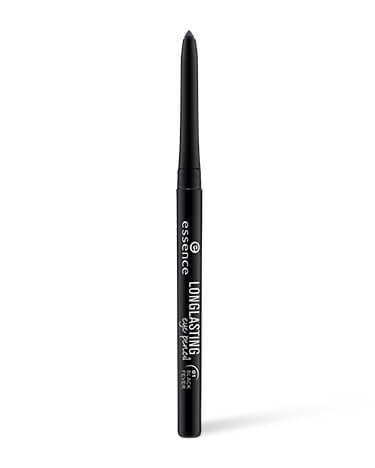 longlasting eye pencil has a rating of 4.7 stars based on 41 reviews. Long-lasting and color-intense! This eye pencil is easy to apply accurately and lasts for hours and hours. Retractable and sleek, this is a true makeup bag essential! Available in 6 long-lasting shades. Cyclopentasiloxane, synthetic beeswax, mica, cera microcristallina (microcrystalline wax), trimethylsiloxysilicate, vp/hexadecene copolymer, myristyl lactate, c30-45 alkyl cetearyl dimethicone crosspolymer, myristyl alcohol, tocopherol, lecithin, ascorbyl palmitate, glyceryl stearate, glyceryl oleate, magnesium silicate, citric acid, ci 77491, ci 77492, ci 77499 (iron oxides), ci 77742 (manganese violet), ci 77891 (titanium dioxide). Cyclopentasiloxane, mica, synthetic beeswax, cera microcristallina (microcrystalline wax), trimethylsiloxysilicate, polyethylene terephthalate, vp/hexadecene copolymer, myristyl lactate, c30-45 alkyl cetearyl dimethicone crosspolymer, myristyl alcohol, polyurethane-11, tin oxide, tocopherol, lecithin, ascorbyl palmitate, glyceryl stearate, magnesium silicate, glyceryl oleate, citric acid, ci 19140 (yellow 5 lake), ci 42090 (blue 1 lake), ci 77000 (aluminum powder), ci 77510 (ferric ferrocyanide), ci 77891 (titanium dioxide).